Rainstorms and flooding in southern China have killed at least 16 people and left hundreds of thousands homeless, according to state-run media. Authorities had sent text messages to more than 1 million people to take precautions in southern China, the Xinhua news agency said Saturday. More than 400,000 residents total were forced from their homes in Fujian, Guangxi Zhuang, Hunan and Jiangxi. At least two people were missing in southeast Fujian Province after downpours that started Wednesday, according to the news agency. The financial damage caused by the rain and flooding — including damaged homes and crops — was estimated at $35.4 million. Destruction included a flooded reservoir and damaged dike in Luocheng County, where fears of a dam collapse forced evacuations. 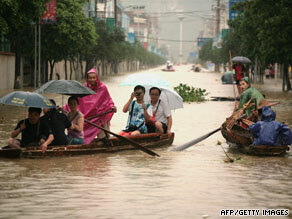 The storms also disrupted traffic, triggered landslides and cut electricity in various parts of southern China.